Spoiler alert: if you’re in high school, you’re probably not. A scary number of high school students barely reach the recommended number of hours of sleep each night, and 60%–70% of teens suffer from some form of sleep deprivation. And this sleep deprivation is a big problem. Sure, many students have heard—or said—the mantra “Sleep is for the weak.” Besides, you can get good grades, be in nine different clubs, on three sports teams, serve as class president, and get by with three hours of sleep a night all at once, right? As long as you have caffeine, right?! This is not exactly true. And by “not exactly,” I mean not in the slightest. Sleep is just as essential to your body as breathing. Drinking enough caffeine to kill a small moose will not make it better. If sleep is for the weak, then the weak have better self-control, better focus, and a better chance of avoiding car crashes. Here’s a closer look at some of the effects of being sleep-deprived among teens and young adults. You know you can’t focus in class when you’re falling asleep in your chair, but if you’re constantly tired, you’re probably not focusing well the rest of the time too, even if you feel okay. “Sleep deprivation affects memory, cognition and motivation, and the effects are compounded when it's long-term,” reports NPR’s Anya Kamenetz. 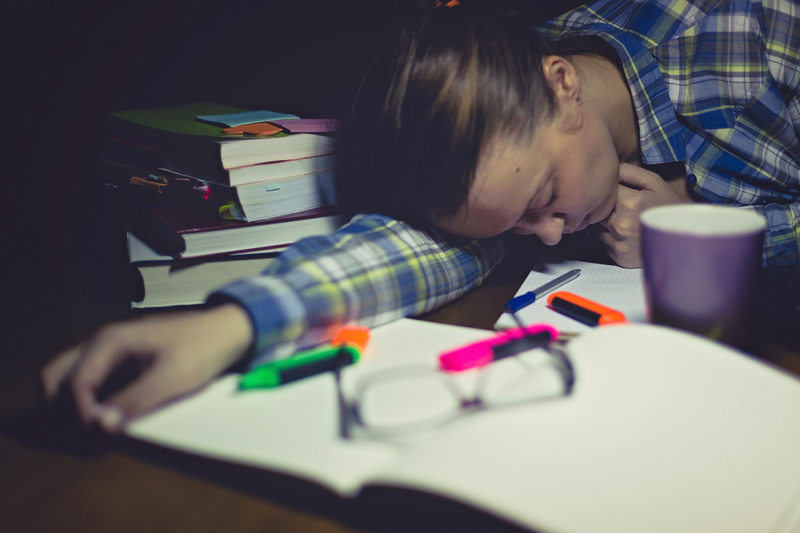 It’s no surprise that not getting enough sleep also impacts your academic performance in high school—which is probably the whole reason you’re staying up late and working so hard in the first place. Many things we attribute to “teen angst” may actually be “sleep-deprived angst.” At one point or another, every high school kid knows the feeling of being bone-weary and willing to give an arm to just go home and sleep. Obviously, when you’re that tired, moodiness is common and people can snap at the slightest agitation. What you might not realize, however, is that lack of sleep can keep you in that agitated state all the time. When people have less than the recommended amount of sleep, they often become more angsty than they would naturally be. Teens who don’t get enough sleep are also more likely to self-medicate with things like alcohol or hard drugs to feel better. Everyone knows how dangerous driving while intoxicated is, but many people don’t know that driving while tired can be just as bad. A study from the University of New South Wales in Australia and University of Otago in New Zealand found that after being awake for 18 hours straight, drivers were just as impaired as if their blood alcohol level was .05—that’s over half the legal limit of .08. That means that driving drowsy is as dangerous as driving tipsy. This doesn’t even account for the fact that those same sleep-deprived teen drivers aren’t as experienced behind the wheel either, which could make for a double-whammy of disaster. In short, go to sleep. And try to get at least seven hours a night. You really do need it. “Umm, sure. But my French paper isn’t going to write itself. Or my college apps. Or my high school yearbook write-up…” you might be thinking. However, it’s important to make sleep a priority. So take a step back and see where you can rearrange your schedule and commitments. Maybe say “no” to some things. Ask for help from friends and family. And remember: you’ll probably be a better student—and get more done—when you’ve gotten enough sleep anyway. If you have trouble getting to sleep or staying asleep, there are a few things you can try. You can work on eliminating stress, come up with a calming ritual before bed, and make your bedroom as quiet and dark as possible. If these tips don’t help and you continue to have trouble going to or staying asleep, or you think you have serious insomnia, you should check with the school nurse or your doctor to make sure there isn’t an underlying medical issue. In the mean time, here are some helpful sleep tips from Oregon State University. And, seriously, if you’re reading this at 1:00 am, go to sleep. So, high school (and even college) students: are you sleep deprived? And are you experiencing any of these icky effects? More importantly, how are you dealing with it? Leave a comment or get in touch.